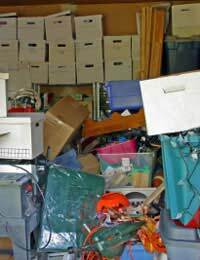 Although not necessarily the biggest spaces garages and sheds usually take the longest to sort out and pack as there often filled with junk you’ve accumulated as well as consisting of unwieldy and sharp tools and other objects that you need to take your time with. You also need to be careful with the likes of liquids and flammable materials such as bottled gas, fertiliser, pesticides and oils. These should not be transported and you should make arrangements to dispose of them in the recommended manner or to give them away to a neighbour. Whether we’re talking about barbecues or power tools, you need to fully drain these items before beginning to pack them. You should remove all detachable parts and store these separately and buy protective covers for anything which has a blade or a chain. Make sure any lids or covers are fully secure before packing. Group together all the tools of a similar length, e.g. spade, rake and hoe and tie them together using some type of strong cord. Make sure you use something like bubble wrap or perhaps an old blanket to cover any sharp edges or blades then they can be secured with corrugated cardboard which you can wrap around them and secure with cod. With smaller tools, hopefully you’ll have a toolbox but if not, put these in a sturdy box and pack them well so that they won’t move about. If you’re putting any of these types of tools into a box, make sure that the box is clearly labelled so that the person who is going to be unpacking it is fully aware of the contents as many of these types of tools can have sharp edges too. You should disassemble any of these items as much as you can. This includes removing legs, glass table tops and any umbrellas off tables etc. Put any soft furnishings like cushions into large clear rubbish bags and securely tie the bags. This will keep them clean and they might also be used to cushion other items during the move. Again, things like swings and slides should be dismantled and remember to keep all the detached parts and screws, nuts etc in separate bags and labelled so you know which parts go with which piece of equipment. Unless you know how it all fits back together, also put the assembly information in with each bag. You should try to put bicycles in appropriate bicycle boxes to protect them from getting scratched or damaged in any way and to stop them damaging other boxes. Your local bus or train company can often provide you with these types of boxes or ask your removal company or a specialist packaging company if they can get hold of any. If you have motorised items such as a motorcycle, scooter, jet ski, boat etc., seek advice from your removal company. If you are so keen on gardening that you intend to take some of your plants with you, your local garden centre will be able to give you advice on moving them. However, if you’re just taking the plant pots, hanging baskets and similar containers with you, treat them the same as you would with plates and bowls from the kitchen and box them up with padding to prevent movement. These type of items usually carry some weight so make sure that you mark any heavy box with ‘Heavy’ on the outside so that the person carrying it is aware of its weight before they attempt to lift it. The key things to ensure when it comes to packing up your garden shed or garage are that all dangerous implements are made safe before you attempt to pack them and that any gas or oil operated equipment is fully drained before it goes on board the removal van.